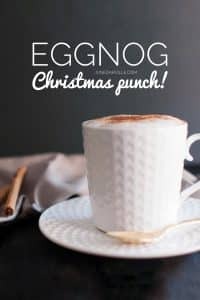 Eggnog (Homemade Christmas Punch) | Simple. Tasty. Good. I couldn’t believe how simple this homemade eggnog turned out to be the very first time I prepared it! I tasted eggnog before but somehow I thought it would be pretty hard to make at home. And because I bought a load of fresh eggs at the farmers market a week ago, I think this is the right time to start experimenting! Enough spare eggs laying around in my kitchen. But I managed to come up with a yummy cup of frothy drink right away. So amazingly smooth and velvety! And I like the touch of the grated nutmeg in it also… I can’t believe how simple this homemade eggnog from scratch turns out to be. Definitely on my recipe list next week for Christmas! Did you know that you can serve this drink warm and cold? Well me personally, I liked it more when it was chilled. But that’s totally up to you! So my recipe below is a chilled one. Looking for a warm version: then here is a great recipe for you. Goes without saying that you can keep this drink alcohol free. Just don’t add the brandy, that’s all! Love my homemade eggnog? Then also check out my creamy homemade eggnog pie or my eggnog cake below! I can't believe how simple this homemade eggnog from scratch turns out to be... Definitely on my recipe list next week for Christmas! 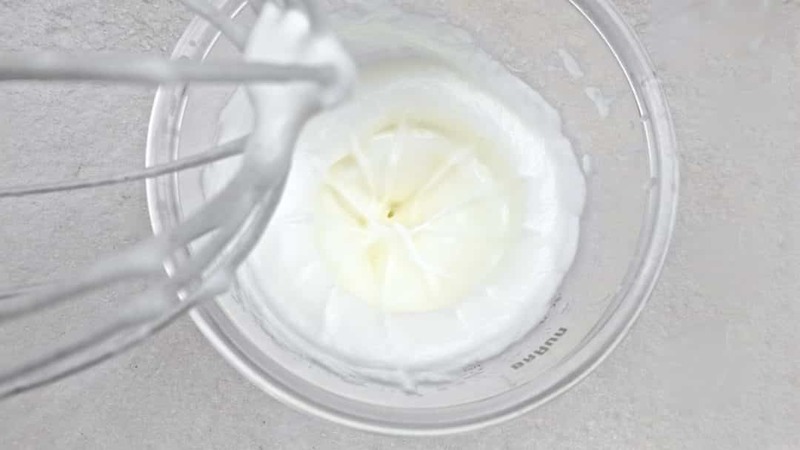 Transfer the egg white to a high cup and beat it until stiff peaks appear. Put this aside until needed later on. 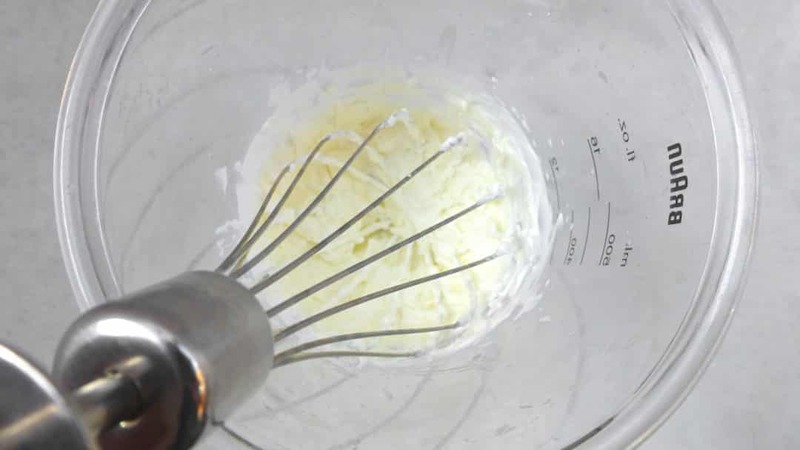 Pour the cream in another high cup and whip it for 2 to 3 minutes or until firm. Put this aside until needed later on. 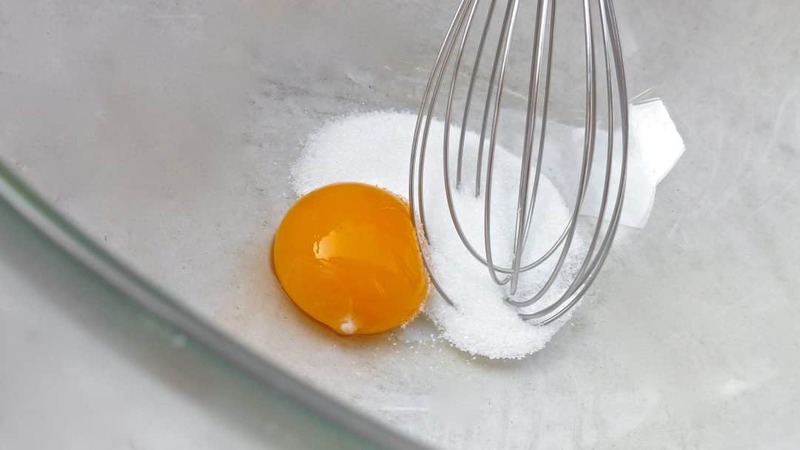 Transfer the egg yolk to a mixing bowl and add the sugar. Beat well for 1 minute until the yolk becomes foamy and pale. Then add the vanilla extract and brandy (or whatever booze you're using). Stir again. Then pour in the whole milk. Season with a little pinch of nutmeg and salt. Stir well into a smooth mixture. 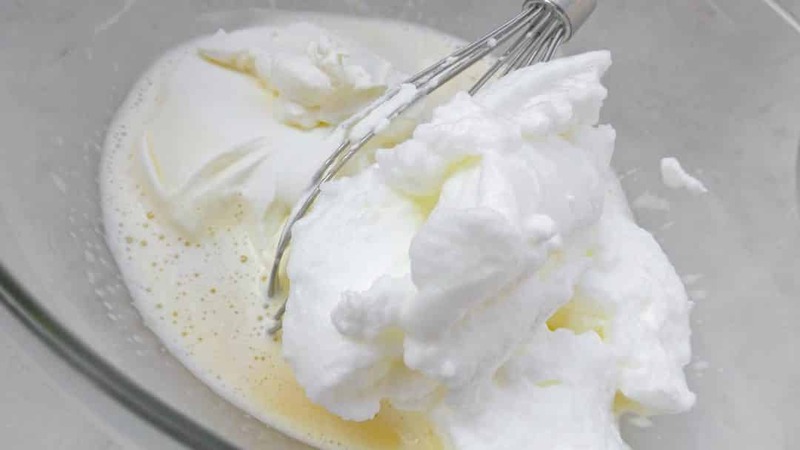 Then add the whipped cream and beaten egg white. Very gently fold both into the creamy egg mixture. Then check the seasoning and add extra booze, grated nutmeg, salt or vanilla extract to taste if necessary. Chill the eggnog in the fridge. Remove it 10 minutes before serving. Then pour the eggnog into cups or glasses. 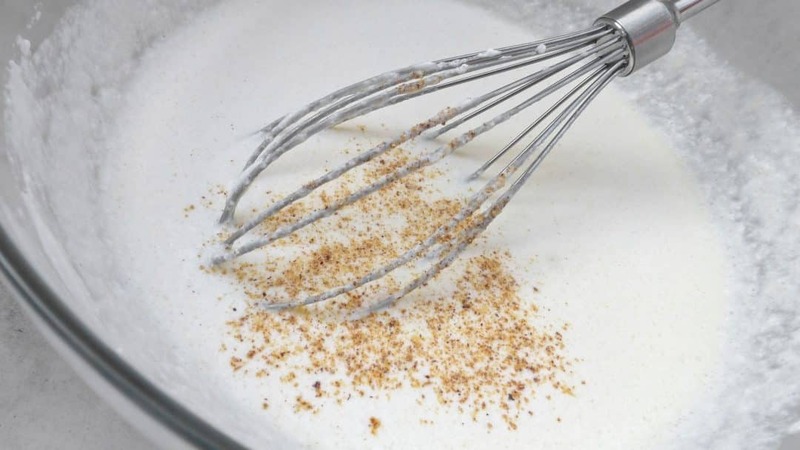 Top with extra whipped cream and sprinkle with ground cinnamon. Serve. This eggnog pie tastes like Christmas! Roll up your sleeves then, we’re making some fresh pastry for the pie shell today. There was a time when I would be afraid of making homemade pastry doughs and dessert in general until that one day when I decided to start experimenting a little. Glad I did ’cause I learned a new set of baking skills. Love baking pies? 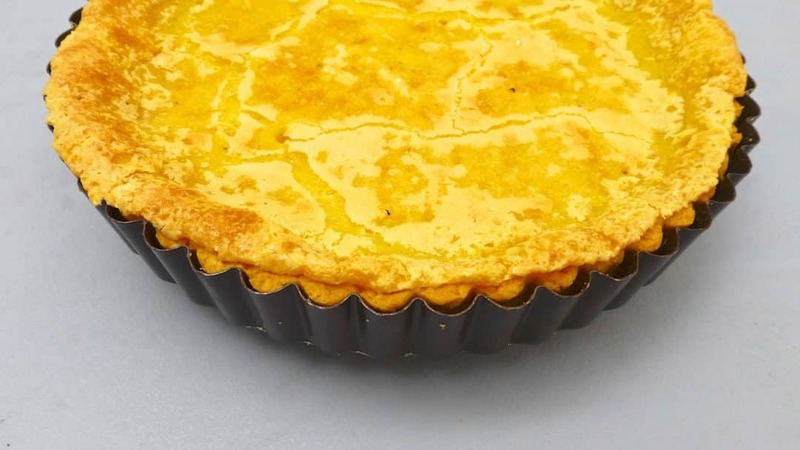 Then also check out my Belgian rice pie! My creamy eggnog pie: set your teeth in a creamy pie filling made of eggs, sugar and a dash of nutmeg... Perfect for Christmas! 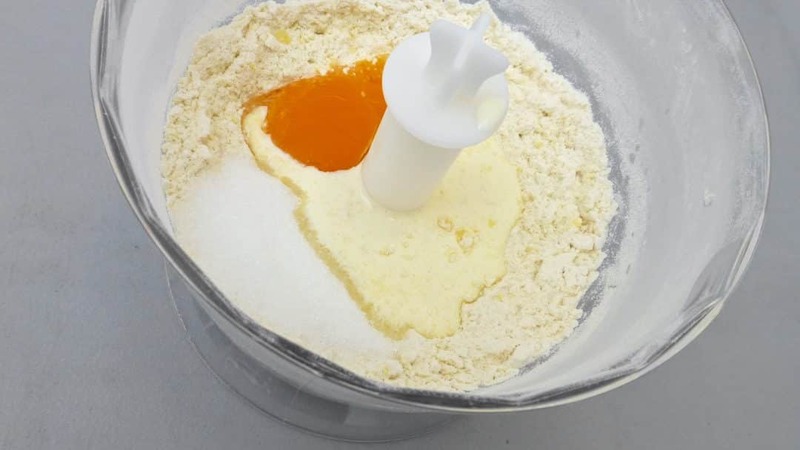 Transfer the self-raising flour and cold butter to a clean blender. Then pulse until you get a fine mix. 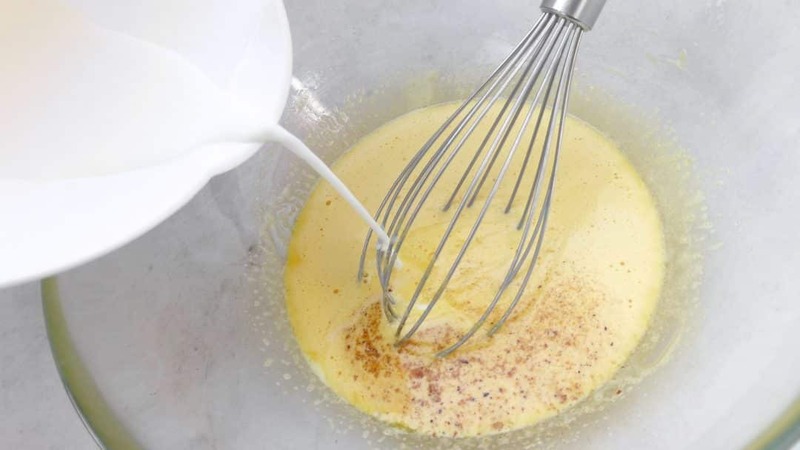 Add 1 egg yolk, 2 tablespoons of cream, a tablespoon of the caster sugar and a pinch of salt. Pulse again until you get a firm yellow dough. It shouldn't be sticky. Then transfer the dough to a clean surface and knead it for a minute. 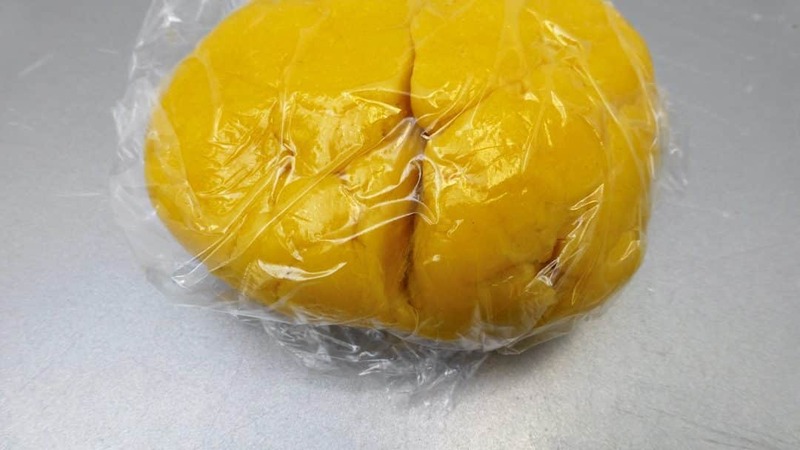 Wrap the dough up in cling film and let it rest at room temperature for 45 minutes. Knead it again and then roll out the dough thinly. 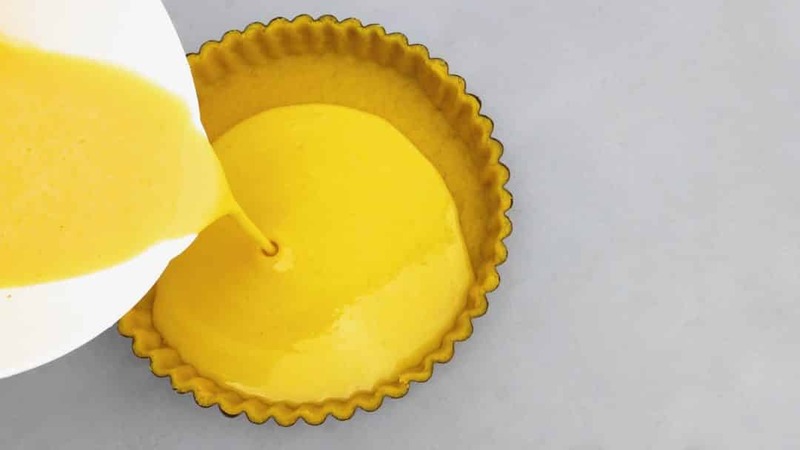 Coat a buttered tart tin (8-inch or 20 cm in diameter) with it. Remove any excess dough. Combine the ground nutmeg, the rest of the cream, the 2 remaining eggs and caster sugar in a mixing bowl. Then pour this mixture in the coated tart tin. 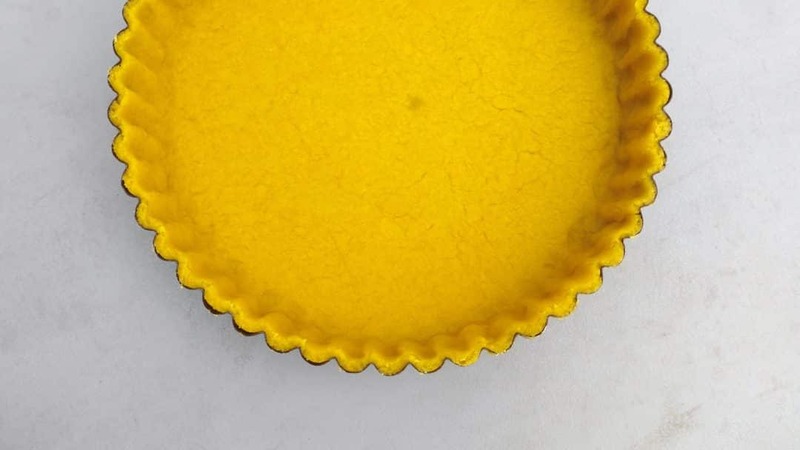 Bake the eggnog pie for 30 minutes in a preheated oven at 437°F (225°C). Turn off the oven but leave the pie inside for another hour. Place a piece of tinfoil on top to prevent the top from burning. Remove the pie and let it cool. You can top it with whipped cream if you like. Then slice the pie up and serve. And we’re not done yet! Another eggnog treat is coming right up, and what a treat this is. My fluffy eggnog cake! 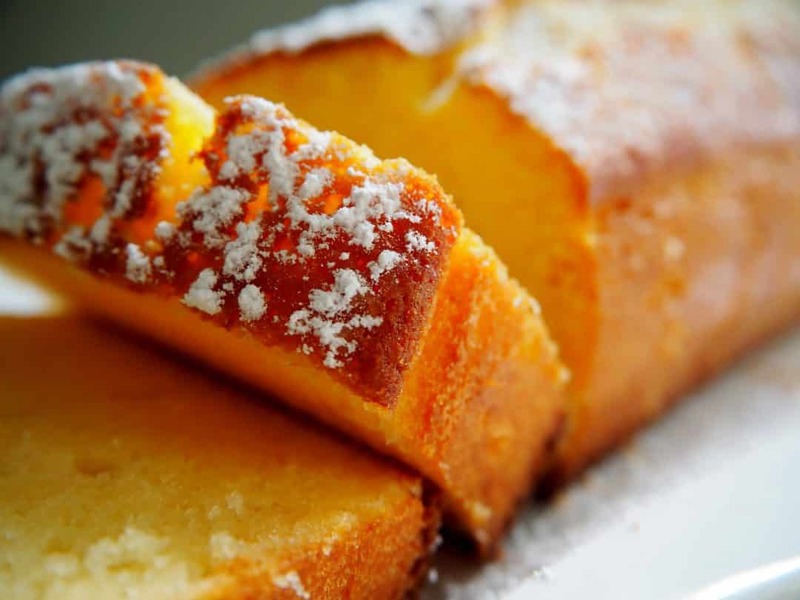 You choose whether you want to keep this cake simple and just sprinkle it with icing sugar or pour a white glaze on top once it has cooled down fully. To make glaze, combine some icing sugar with just a couple of drops of water and spices like nutmeg or cinnamon. I sometimes add grated lemon zest and lemon juice to it also. Whatever you prefer! Add all the ingredients for a large mixing bowl. 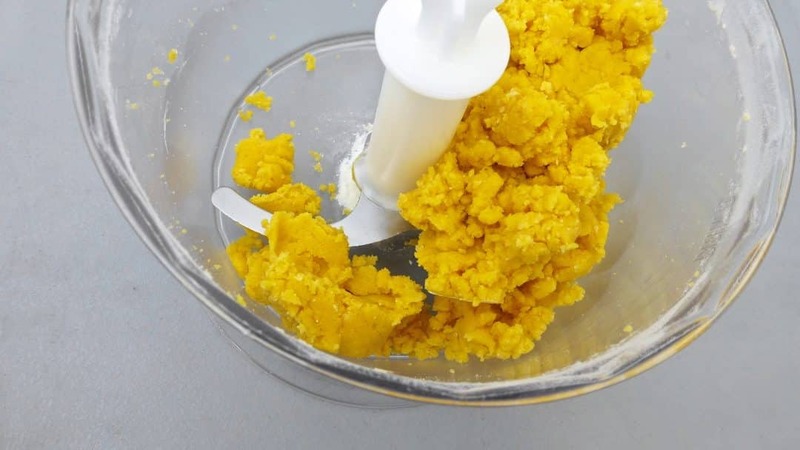 With a large spoon mix it all until the cake batter is well combined. Make sure that there are no lumps in the batter at all. 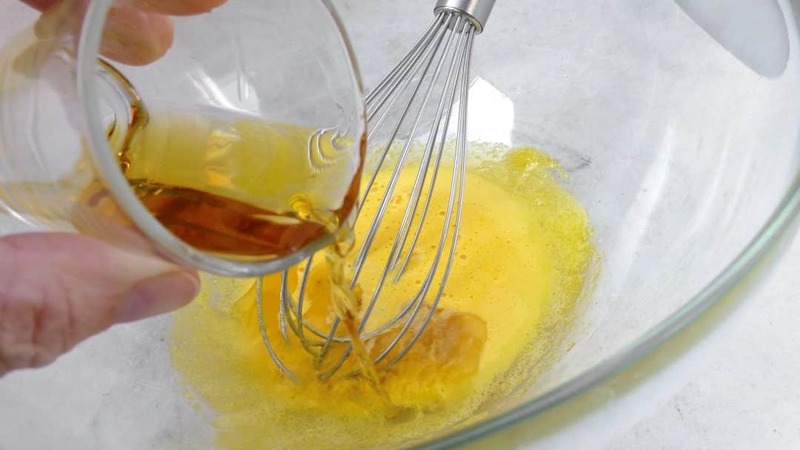 Grease a large rectangular cake pan with some unsalted butter or cooking spray. Then pour the eggnog cake batter in the cake pan. Place the cake pan in preheated oven to 350°F (180°C). Bake the cake for about 40 minutes. Insert a toothpick in the middle of the cake, if it comes out clean the cake is cooked through and fully set on the inside. Then remove the eggnog cake from hot oven and let it cool down in the cake pan. Once the cake is cool enough to touch, remove it from the cake pan and let the cake cool for another 20 minutes on a wire rack.